Today marks the 160th anniversary of a seminal, but largely forgotten moment in the history of the conservation movement. 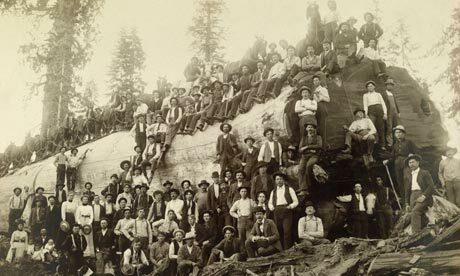 On Monday, 27 June, 1853, a giant sequoia – one of the natural world’s most awe-inspiring sights – was brought to the ground by a band of gold-rush speculators in Calaveras county, California. It had taken the men three weeks to cut through the base of the 300ft-tall, 1,244-year-old tree, but finally it fell to the forest floor. A section of the bark from the “Mammoth Tree”, as newspapers soon described it, had already been removed and was sent to San Francisco to be put on display. The species had only been “discovered” (local Native American tribes such as the Miwok had known of the trees for centuries) that spring by a hunter who stumbled upon the pristine grove in the foothills of the Sierra Nevada whilst chasing an injured bear. Word of the discovery quickly spread. The remarkable, engaging story of these two doomed trees is too detailed to be told here, but what is worth recalling on this anniversary is the reaction their destruction caused in the media at the time – and its subsequent effect on some progressive politicians a decade later when they cited their felling and exploitation as an inspiration to establish what later came to be known as the US national park system. Was the outrage expressed by some in the popular media of the day evidence of the first stirrings of an environmental consciousness in the US? It would be wrong to assess such statements without noting the historical context of that age – a time of the “manifest destiny” when nature was viewed as a God-given resource for Mankind to exploit – but it is also hard to ignore the clear outrage and bemusement among some commentators that such magnificent natural specimens had been brutalised in this way. 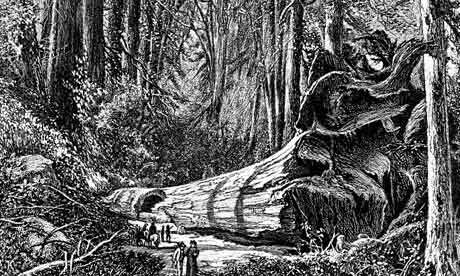 On 27 June, 1853 – the same day the tree finally fell – a report in San Francisco’s Placer Times and Transcript also noted an article, again in the Sonora Herald, expressing regret that Captain Hanford was preparing for a “portion of the mammoth tree” to be sent to New York. “Amator” [Latin for “friend”] is dreadfully shocked at the vandalism and barbarity of flaying that giant of the woods, and depriving California of its greatest “growing” exponent. 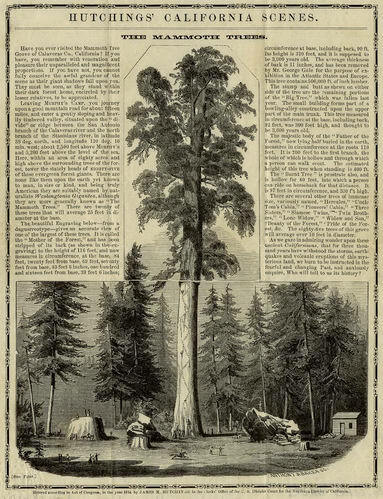 However, the same report also goes on to say that the stripping of the tree’s bark is “characteristic of California enterprise” and that Hanford’s efforts to exhibit the bark in New York will allow “millions of the inhabitants of the earth to see it, has rendered his adopted state a lasting benefit, given to science a page, and the world a natural curiosity”. So any sadness at the tree’s demise was counteracted by the boost to local pride. To our mind it seems a cruel idea, a perfect desecration, to cut down such a splendid tree…In Europe, such a natural production would have been cherished and protected, if necessary, by law; but in this money-making, go-ahead community, thirty or forty thousand dollars are paid for it, and the purchaser chops it down, and ships it off for a shilling show! We hope that no one will conceive the idea of purchasing the Niagara Falls with the same purpose!…But, seriously, what in the world could have possessed any mortal to embark in such speculation with this mountain of wood? In its natural condition, rearing its majestic head towards heaven, and waving in all its native vigour, strength and verdure, it was a sight worth a pilgrimage to see; but now, alas, It is only a monument of the cupidity of those who have destroyed all there was of interest connected with it. A tree of such gigantic proportions as well might excite the wonder and curiosity of the world. Although the destruction of such a magnificent object was an act of vandalism not to be forgiven, yet the desecration has been committed, and it is useless now to reiterate our vain regrets. The finest, the most beautiful and symmetrical of these trees, (though not the largest) has been cut down…From this beginning, unless the Goths and Vandals are arrested in their work, the destruction of the incomparable forest will probably go on till the last vestige of it is destroyed. 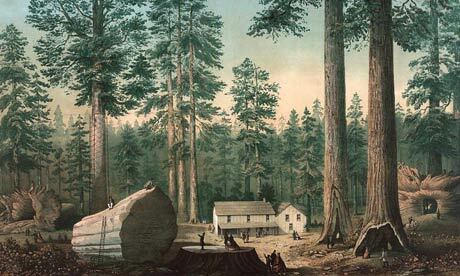 In this view, the point that we make is, that the State of California and the Congress of the Union should interpose to preserve these trees, as the living proofs that the boasted monarchs of the wood of the Old World are but stunted shrubbery compared with the forest giants of our own country. We say that Congress should interpose, upon the presumption that these trees are public property, are on the public lands of California, and because Congress has already interposed to protect the public live oak forests of Florida from the rapacity of unscrupulous speculators…We repeat, that it is the duty of the State of California, of Congress, and of all good citizens, to protect and to preserve these California monuments of the capabilities of our American soil. Let it be the law that this…Mammoth Grove shall stand. In our estimation, it was a sacrilegious act; although it is possible, that the exhibition of the bark, among the unbelievers of the eastern part of our continent, and of Europe, may have convinced all the “Thomases” living, that we have great facts in California, that must be believed, sooner or later. This is the only palliating consideration with us for this act of desecration. From the Calaveras grove some sections of a fallen tree were cut during and pending the great World’s Fair that was held in London some years since…The English who saw it declared it to be a Yankee invention, made from beginning to end; that it was an utter untruth that such trees grew in the country; that it could not be; and, although the section of the tree was transported there at an expense of several thousand dollars, we were not able to convince them that it was a specimen of American growth. They would not believe us. The purpose of this bill is to preserve one of these groves from devastation and injury. The necessity of taking early possession and care of these great wonders can easily be seen and understood. The bill passed and the “Yosemite grant” paved the way for the first official national park being established at Yellowstone in 1872. 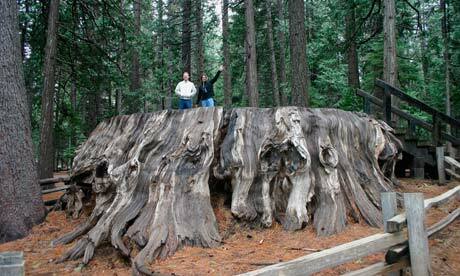 Celebrated conservationists such as John Muir would all later visit the stump of the original “mammoth tree” to reflect on both its fate and influence. However, the grove of sequoias at Calaveras – where the story of the US conservation movement arguably began – did not become a state park until 1931 following a decades-long fight to see off the desires of lumber companies. Today, the trees are now safe from the “Goths and Vandals”, but not, alas, some of the side-effects of modern civilization: urban ozone, climate change, uncontrolled frequent fires, to name but a few.